"Military force to destroy their nuclear capacity," he continued. "That should be our objective. Why? Because that is what our national interest is. To prevent an Ayatollah who chants ‘death to America' and ‘death to Israel' from ever having weapons capable of murdering in a flash of light millions of American souls." "Critically, if it ever comes to military conflict, our objective shouldn't be to invade and try to turn Iran into a democratic utopia; instead, it should be to defend America and prevent a nuclear Iran," Cruz said. "Clear, simple, focused with an unmistakable end point." "And if military intervention becomes the only way to stop a nuclear attack on American cities," he continued, "then of course we have to be willing and able to do so with overwhelming force." "That unequivocal promise, by the way, is our single best hope at deterrence," Cruz said. However, military intervention is not a solution for all that ails the globe, Cruz said, as he criticized both Republican and Democratic former administrations. "We should not rush into the arms of isolationism as if it were the reasonable alternative to intervention—as if our only choices are to bomb the world into democracy or ignore the world into peace," he said. "It is not a binary choice," he said. "There is a third option, not an intermediate point between the other two, but rather a third point on the triangle: national interest." "Some have never met a country they didn't want to invade," Cruz continued. "Others have never met a theater they didn't want to abandon." Neither of these choices are ideal, according to Cruz. "Neither is the right answer. Instead, we should be fierce and resolute in defending America and defeating our enemies, but we should also be extremely reluctant to intervene militarily and risk the lives of our sons and daughters," he said. The Trump administration must leverage America's powerful international voice to combat rogue regimes and harmful nations, such as Russia, China, and other regimes. "When it comes to tyranny, when it comes to human rights abuses across the globe, we should use that voice across the world," Cruz said. "This is something all too often the isolationists don't understand. That just because you may not be prepared to send in the Marines, doesn't mean America should be silent in the face of human rights abuses and injustices." In comments echoing those expressed by Trump at various junctures, Cruz said the United States "cannot invade all the world to set it right. As it has been said many times: We are not the world's policeman." "But there is also great force in America's principles, and in loudly and unapologetically advocating those principles," he said. 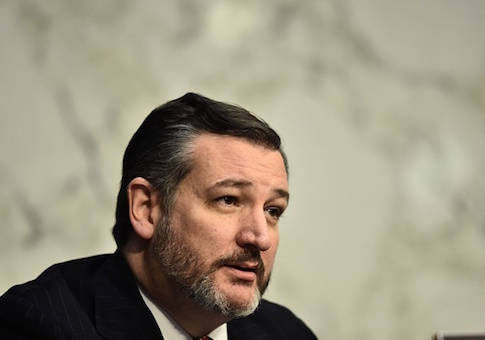 Cruz also expressed concern over a new class of Democratic leaders who are unabashed in their criticism of Israel and America's efforts to isolate Iran. "Last night at the State of the Union address, virtually every Democrat in Congress sat stone-faced when the president referenced pulling out of the Iran nuclear deal," Cruz said. "Last night, virtually every single Democrat refused to applaud moving our embassy to Jerusalem—despite the fact that most of them claimed to support that policy just a few short years ago." Cruz went on to implore his Democratic colleagues to chose a more middle-of-the-road policy. "Wanting to avoid war does not make one a coward, or weak," he said. "Wanting to stop terrorists and protect against hostile regimes does not make one a warmonger." This entry was posted in National Security and tagged Ted Cruz. Bookmark the permalink.